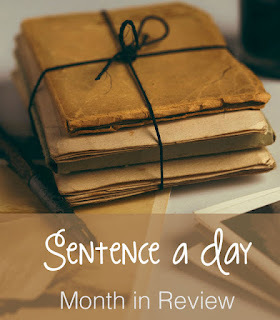 Thanks to Leslie at Once Upon A Time & Happily Ever After and Tamara at My Retirement Project for introducing me to “sentence a day” month in review. Welcomed April with Spanish lessons, gym, grocery shopping, and free viewing of contemporary art exhibits at the Power Plant. It was a beautiful Sunday, perfect for walking 6.5 km (4 miles) and reflecting on the month of March. A combo of learning Spanish, exercising in the gym, getting some house chores done, and cooking a tasty dinner that my family loved, made a good Monday in my book. Wished a dear friend a happy birthday and laughed together. Kept the day simple with yoga and light work. Enjoyed a fun Friday with Spanish lessons, gym, a blog post on Lisbon & Sintra, and a cappuccino at Dineen Coffee with my best friend. Resumed indoor swimming after the winter break, starting with thirty laps. It was a productive Sunday with a 5.6 km walk (3.5 miles), a blog post, and close-to-done packing for my parents’ move. "Rinse and repeat April 3rd" meant another good Monday. Read and day dreamed about visiting Gibraltar, Spain, Budapest, and Prague. It was hump day with Spanish lessons, gym, house chores, and packing last minute items at my parents’ place. Moved and unpacked quite a few of these bins for my parents. It was a fine Friday after the move. I could swim thirty four laps this morning, yay! Felt fit and creative after running 5 km, publishing a blog post, and making a good family meal. It was my kind of Monday when I made progress in Spanish, exercised, and finished booking for our Costa Rica trip. Felt stunned and sad to know a neighbour died of a heart attack at the age of 57. Completed my income tax return, and double checked. Started thinking more about my condo refresh project in May. Packing was light and easy for my family weekend getaway. Thirty six laps in the pool made a great Saturday morning! Enjoyed my family weekend getaway very much, with fabulous weather, and Chinese food for dinner on Sunday. Felt pleased to add a few check marks on my Spring activity list. Learning a new language and doing gentle yoga are fun. Blogging and connecting with other bloggers are also fun. My Spring list update reflected my personal goals for the year in the categories of Fitness, Finance, Family, Friends, and Fun. Viewed Valerie Blass’ “Nous ne sommes pas des heros” exhibit and enjoyed jazz for free at Brookfield Place. My sister gave me these two cute zippered pouches. Jumped start the day with a brisk 5K walk in 5C (41F) weather plus windchill, then wrapped up the rest of April with my sister, family and warm hugs. Wow, Natalie....you make me feel like a sloth in comparison, LOL!! I need to hang out with you to get back into shape!! Glad you joined us in this fun monthly diary!! Thanks, Jodie, for dropping by. I try to stick to my fitness routine even though it's also very easy to talk myself out of it :-) The hardest part is to leave the comfort of home. Great recap! I love all your physical activity! I joined Sarah and Leslie in January in writing a sentence a day and absolutely love it. Feeling slothy over here, too! Let me start by asking...what constitutes a lap in the pool. Down and back OR down. And back is a second lap? And then how many feet from one end to the other of your pool? I am hoping to get back to swimming laps IF we EVER get to get in our pool! Tired of just brushing it deckside. So glad you have moving your parents behind you. That was a lot of work. Hope they are happily settled in their new home. I think I am ready to quit working. Have so many things I want to do like you! Spanish lessons, swimming, walking, yoga. You are an inspiration. Could you call PC and tell him I want to retire for real this time? A lap is one length of the pool. The community pool that I use has a good size. My guess is 25 yards from one end to the other. You'll get to use your pool soon, Leslie, and definitely get back to swimming laps as I find doing it really builds up endurance, stamina and reduces stress. I was glad that my parents' move went smoothly. They're settled fairly quickly as we've pretty much arranged all the services they use to be available either on the first day or within the first week after the move. Hi Natalie it is my first time linking up at Sentence A Day. What a great fit and fabulous month you had. Well done with the swimming laps and also the Spanish lessons. I'm still trying to master Italian for our visit to Italy later this year. Have a great May and look forward to your Sentence a Day post. Hi Sue, it's my first time linking up to Sentence a day, too. I'll hop over to your blog soon. Have a great May!